kid friendliness: high chairs available, but seemingly quieter ambiance for business lunch set. It's interesting that within the span of two weeks, two different friends choose Pearl Liang as the meeting place for lunch. 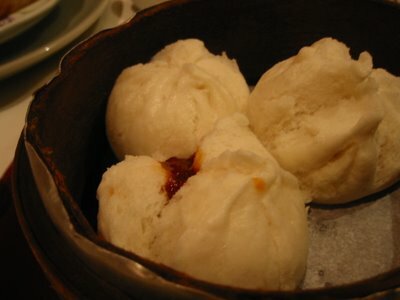 Perhaps for its elegant, quiet ambiance or maybe for its varied selection of dim sum. The first visit (from which all the pictures are from), we ordered the Dim Sum set menu, which includes a soup, congee, fruit and all you can eat dim sum (which is usually available only weekends and holidays). The second visit we ordered the business set lunch available weekdays. My lasting impressions from both lunches is that they have great dishes and they have some not-so-great dishes. It's a crapshoot. 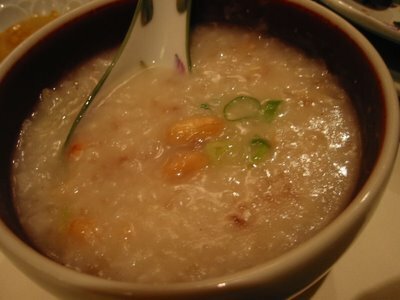 With the dim sum set menu, I really enjoyed the soup, most of the dim sum, but didn't care for the porridge. With the business set menu, I didn't like the soup at all, found the scallops main dish to be very small, but thought the rice noodles were decent. In both cases, I didn't like the fruit which tasted as if they had been soaked in syrup or sugar water or something like that. 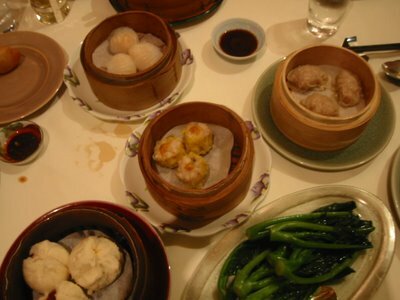 The all you can eat dim sum set menu is a good deal if you have a big appetite, or want to try a large selection. Otherwise, it would probably be more affordable to just pick out your favorites if you have more people in your group. I found the radish cakes not crispy or moist and the cha sau bao to be dry (even the bbq meat part). 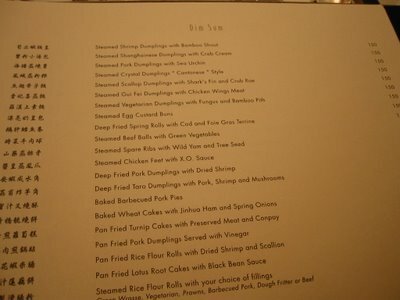 The fried items were a bit greasy, but the steamed items were good. 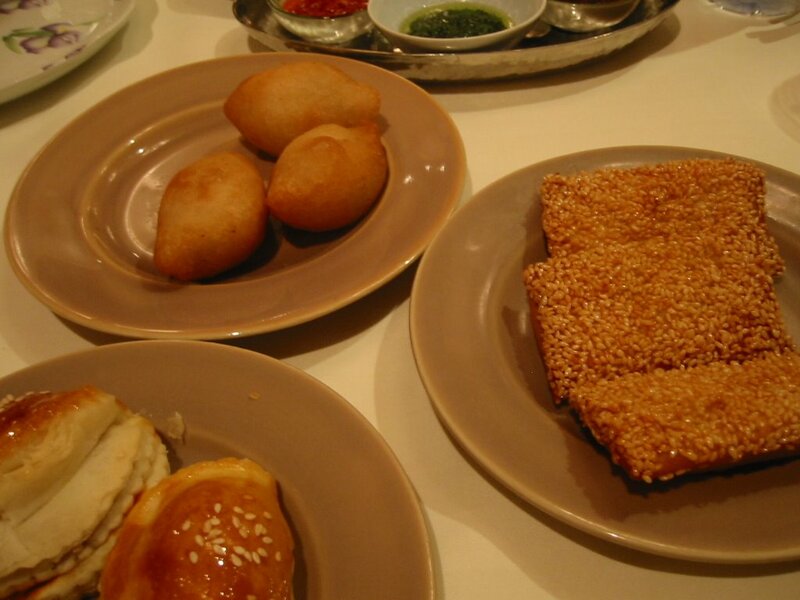 I guess at NT$150 a basket for 3 or US$5, I expect it to be nearly the best dim sum I've ever eaten. But it wasn't, by a long shot and quite disappointing. I've also been back to Pearl Liang since then for a family set menu dinner which was surprisingly good for my lunch experiences there. 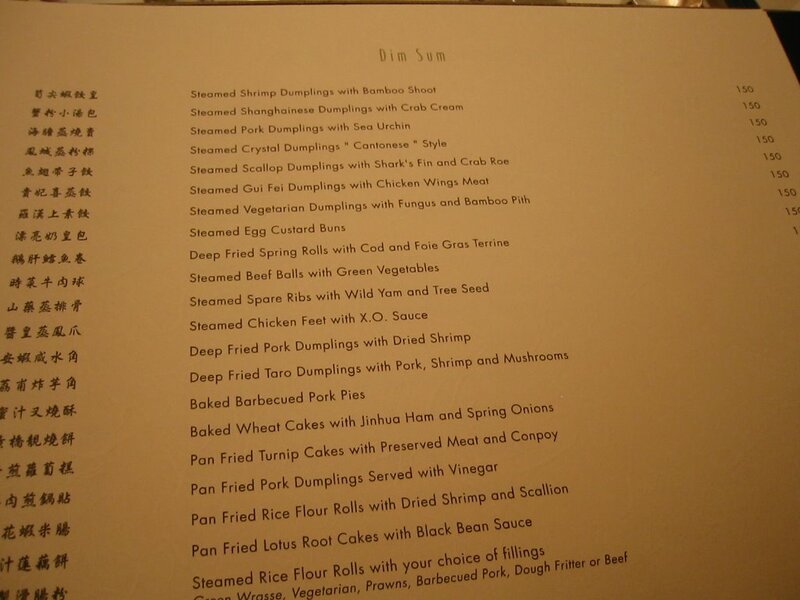 I suppose they chose good dishes from the menu or maybe their dinner is better than their dim sum. They have a lot of private rooms of different sizes so it's good for huge extended family sit down dinners. 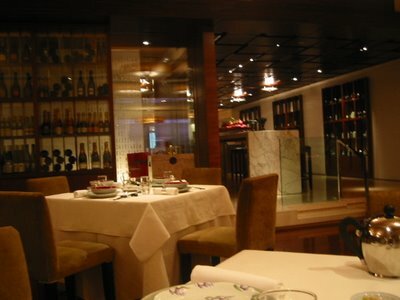 Definitely a place for a special occasion as the prices are a splurge (at least NT$1000/person and average up to NT$3000 a person for set menu dinner) and the service and food can make you feel quite special. From the origami tuxedo napkin to the manager Robin (for whom the restaurant is named) coming by and saying hello- there are little touches at Robin's Grill Teppanyaki that set it apart from other grill places in Taipei. The grill side also has a self serve salad bar as well as a dessert bar that is included in your set menu dinner. The french onion soup was gorgonzola-ish, beef onion brothy-licious and flavorful while the asparagus appetizer was quite bland and flat for what I expected. I'd recommend getting the rib eye steaks alone over the surf and turf, as my filet mignon was not as delicate and melt in your mouth orgasmic as my fellow diners. The lobster was also quite ordinary and a bit overcooked, so save all your stomach and plate room for the steak. Whatever cut of prime choice rib eye my friends had that day was probably some of the best red meat I've ever had in my mouth. I was extremely jealous after tasting it in contrast to my own steak because my dish tasted unfocused, like the chef was too busy preparing the lobster AND the steak that he made two so-so dishes instead of one spectacular dish, which their's were. It was worthy of the night out. The souffle is also beautifully presented, but not as sweet or moist as the ones I've tasted from Joyce East, so unfortunately it wasn't as tasty as it looked. Luckily, we fufilled our sweet tooth with coffee and vanilla ice cream from the dessert bar. I do want to check out the Teppanyaki portion as I've heard good things about it. They also have large private rooms for parties and families for the teppanyaki part. I know that the regular steak places around town are Ruth Chris (which I haven't been to in Taipei)- so be sure to add this one to your list if you are craving a good rib eye in Taipei. And I think if you were celebrating a special occasion and you told them while you made your reservation, they would be sure to make your night even more special. Moga is my new favorite local Italian restaurant- the food is delicious and satisfying, the service is personal and attentive, the ambiance is modern and simple, and did I say how much I liked the food? 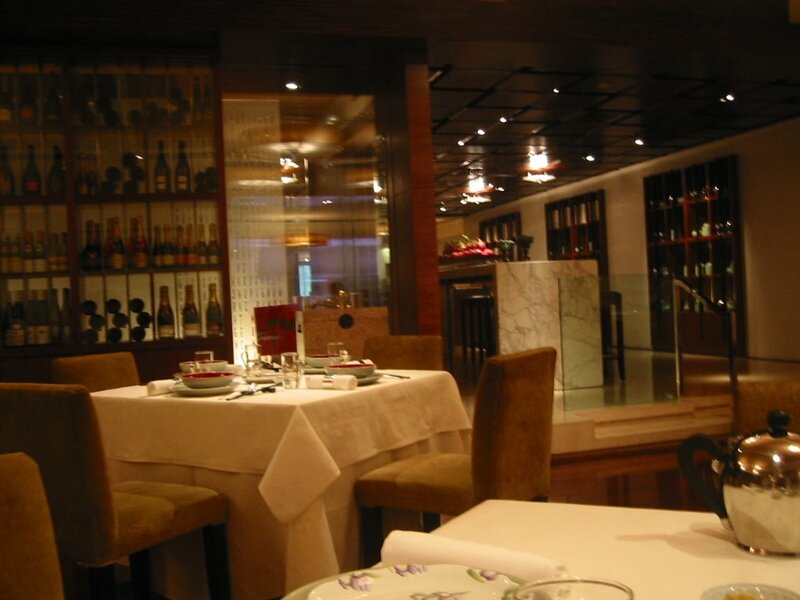 The style is Italian meets Japanese, which seems to influence everything from the food to the service. For many of the Italian spots I have been eating at regularly in Taipei, my return visits have disappointed with each visit- however, with Moga, the food and experience became better. 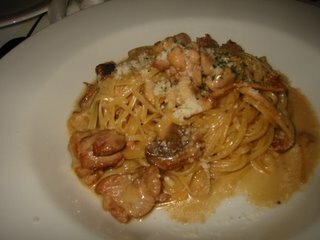 Perhaps it was the noisy downpouring of rain from the incoming typhoon, perhaps it was eating pasta while nearly 9 months pregnant- whatever it was, I'm itching to eat there again. 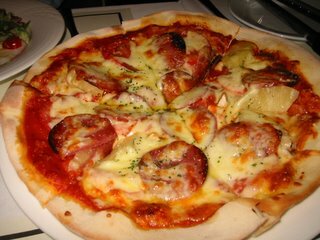 We ordered salads, appetizers and a pizza to share family style, and our own pastas or main courses to eat individually. While the specials on the board are in Chinese, the menus are in both English and Chinese. The pizzas were listed in Chinese, and the server stated that I could make my own desired combination if I didn't see what I wanted on the board. We ended up with a Hawaiian style pineapple, sausage, tomato and mushroom pizza that had crust with body and crunch, a healthy amount of toppings and cheese, but didn't overweigh the crust. It wasn't too doughy unlike a lot of 'homemade' style pizzas I've ordered at other restaurants. 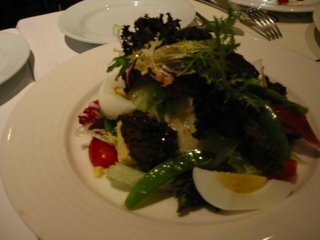 The salads were refreshing and plated for each individual. Due to some miscommunication, the server gave us two salads plated this way, including some type of salad that included a meat that was a bit unidentifiable. I think it was fish? I would stick with the standard mixed greens salad that comes with slices of an hardboiled egg and cherry tomatoes and a light vinegrette. The appetizers I would order again are the bruschetta and the mozzerella and tomato- I didn't care for the chicken wings. I ordered a chicken linguine with porcini sauce that seemed to melt in my mouth. The porcini sauce was creamy but not too heavy, the linguine was slippery, but held onto the sauce, and the chicken was tender and not overdone. The portion was just right and the sauce left a pleasant lingering mushroom taste. 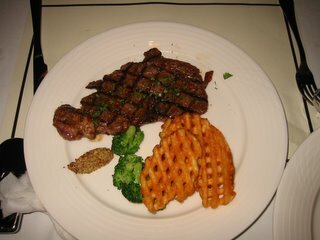 My friend ordered the rib eye steak, which was nicely grilled and accompanied by a few crispy waffle fries that happened to make their way to my plate. For dessert, we ordered a selection to share: the creme brulee, the tiramisu, the chocolate cake and the panna cotta. My favorite was probably the panna cotta which milky and not too sweet, came covered in kiwi. 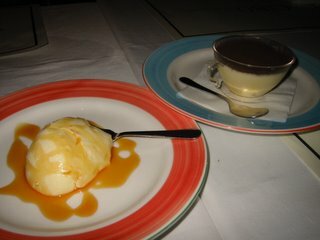 The creme brulee was not as expected having a carmelized crust on top, but rather was a scoop of eggy-flan like custard covered a bit of caramel sauce. 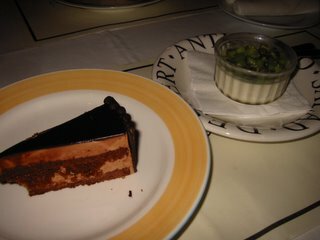 The tiramisu was more whip creme than ladyfingers and the chocolate cake didn't leave much of an impression. 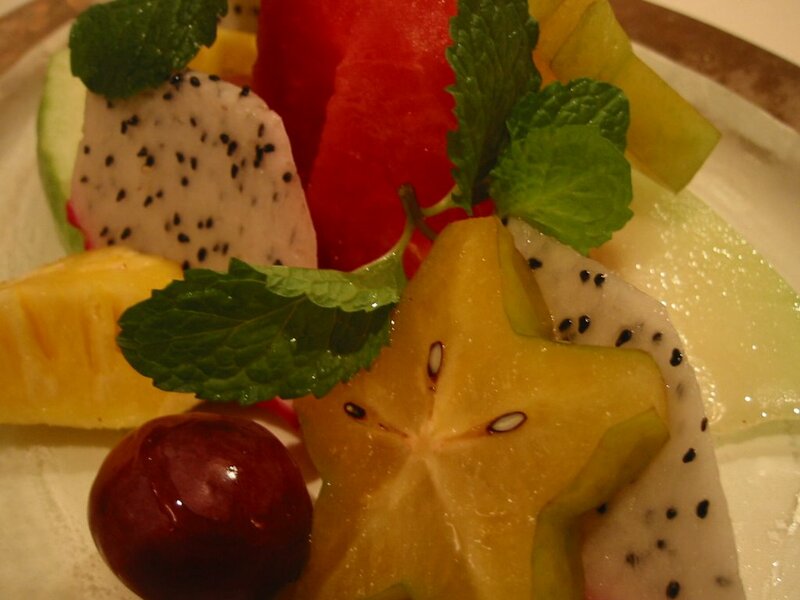 Appetizers are $180-280 NT, pastas are $320-380 NT, meats are around $580 NT, and desserts are $100 NT. With drop down screens that can separate the close tables, it's a place suited for a romantic dinner for two or a group dinner. It's a small and intimate space, so call ahead if you want to be sure to get a seat. It's more stylish than Cosi o Cosi, much better tasting than Diamond Tonys, a better value than Pasta West East, and more original than Macaroni Grill- so that's why Moga is my new favorite. Beware of the upsell! After eating at Moga again, I have to warn new customers that while the food is very good, you will get charged for everything. Sometimes, like last night, the service is slow with one server and a full house. I had originally written up Moga as strongly recommend, but now I've lowered it. The service was slow when we went last night, and we had ordered the gorgonzola cheese bread appetizer. We asked the owner about it and she apologized for the delay and gave us some garlic bread. After we got our appetizer, there was some delicious melted cheese still in the dish, and we requested a piece of plain bread. When we got our bill, we were charged NT$80 for 2 slices of garlic bread and NT$30 for 1 slice of plain bread. Now I am not the happiest about paying US$1 for a piece of bread that most restaurants give a whole basketful of when you sit down for free, but we requested it so fine. But the garlic bread was given to us, not ordered, and I didn't expect to see it on our bill. Also, as part of our set course, we got a soup. The owner recommended a clam soup to me. It was not bad, clams in a clear broth. However, on the bill, she charged me an extra NT$100. She also recommended a cheesecake for dessert, a special one from Japan. So we said sure! It was heartshaped and huge! 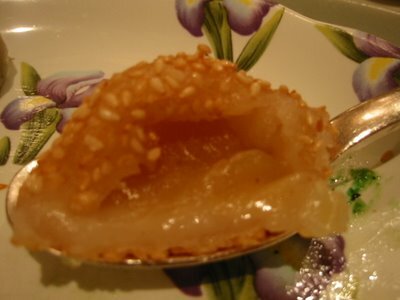 But then we were charged NT$600 for it though dessert was supposed to be part of the set course. Friends we had run into last night also were surprised to see their bill totals as a result of the set course upsell. So while a plate of pasta is a reasonable NT$380 if you order salad, soup, dessert drinks, it WILL add up. Don't assume that what she is recommending is part of the package, and if you are on a budget and in doubt, ask! Chili House is known for their spicy Sichuan dishes such as their chili wontons or chili soup noodles. But despite walking into the newly modern decor, you might be surprised to encounter some brusque service. It's not intentionally rude, they are just too busy trying to get everyone their food and making space for the customers. Apparently the family run business has been around a long time, so they focus on the food and not making small talk. My friends who are regulars here order their favorites, but commented afterwards that the wontons weren't as good as usual that day. This is perfect for those looking for fire alarm hot Szechwan cuisine, but it was tooo spicy for me. SPICY! Too spicy to eat and taste anything else but chili. If you can handle this type of spicy, you have a strong stomach and your tastebuds are dead. Just kidding. 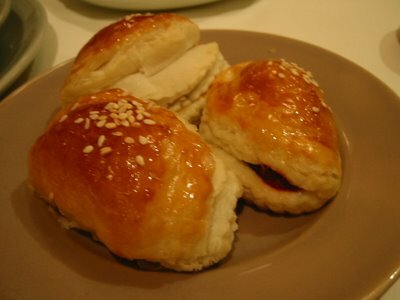 If you like the spicy in Indian and Korean cuisines, then you probably will like Szechewan spicy. 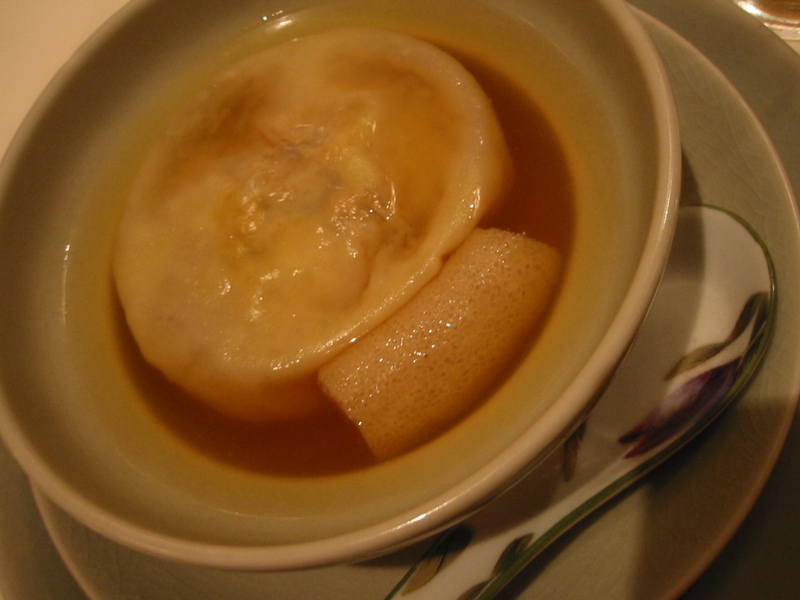 I had to stick to the non-Chili wontons, noodles and dishes. I liked the peanut butter consistency sesame noodles more than the meat sauce noodles, and we also ordered some sweet peas with chicken and steamed spare short ribs. It's affordable authentic Chinese food like Din Tai Fung or Jiu Ru but with the option to test out your chili tolerance. It's actually nicer inside than Din Tai Fung and it seemed a popular place for locals, as the lunch hour was packed and my friends encountered at least 3 other parties that they knew. I'd go back to try it again, but only the non-Chili variety. If something mysterious and fried reaches your plate in the middle of a multi-course meal, would you just dig in or would you ask questions first, eat only after consideration? I'm the second type. Don't know if the lone Lay's chip helps or hurts. Also, why do they serve noodles/rice at the end of a 8-10 course meal? It's usually the best part and you're too full to eat more than a bite.